Where’s Waldo starting his 100th birthday celebration? On TriMet! TriMet General Manager Neil McFarlane and Centenarian Waldo Johnson during his birthday surprise on Line 77. 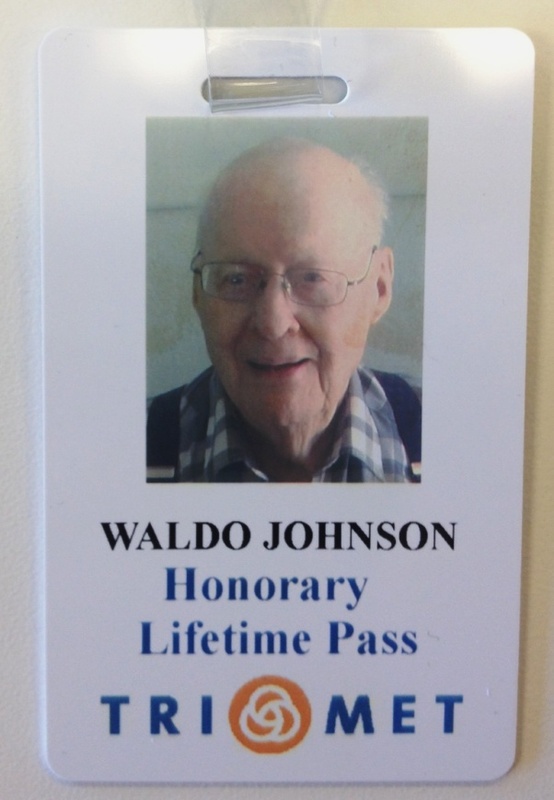 Waldo Johnson will soon celebrate a birthday few of us reach – he’s turning 100 years old! TriMet and some of Waldo’s closest friends got the celebration started with a surprise party on a bus Friday morning, July 12. The Line 77 bus pulled up to pick up Waldo at his regular stop on NE Halsey with HAPPY 100th BIRTHDAY, WALDO! in bright, bold letters on the overhead sign. Waldo’s lost most of his vision to macular degeneration so he couldn’t make out the sign but he couldn’t miss the round of applause and a roaring rendition of “Happy Birthday to You” sung by fellow riders, friends and TriMet General Manager Neil McFarlane when he boarded. “What a WONDERFUL surprise. 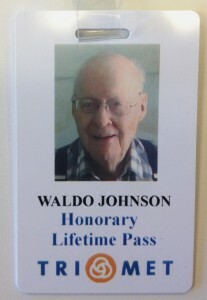 Everybody is so nice,” said Waldo Johnson. 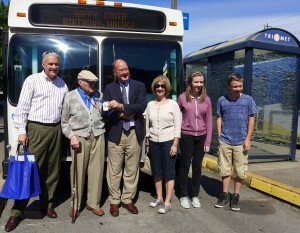 McFarlane and Johnson display the honorary lifetime TriMet pass surrounded by the Holst family. Born in 1913, Waldo’s 100th birthday is July 16, a birthday shared just by chance with the woman behind the wheel of the bus on Friday, Luerine Jackson, a 27-year TriMet bus operator. Waldo will be out of town on his actual birthday, celebrating with his younger sister and brother – both in their 90s and going strong. He was born in McCool Junction, Nebraska, but has lived in Portland the majority of his life – more than 74 years. Waldo has ridden TriMet for decades. 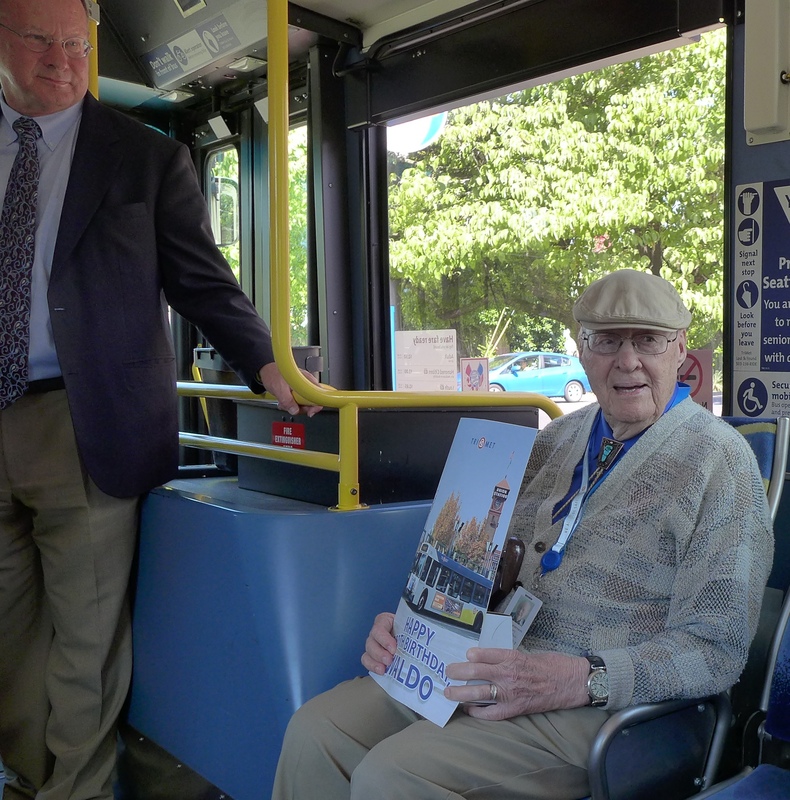 He and his late wife, Ellen, had only one car, so he’s been using transit in Portland since before TriMet—since the first streetcar era, in fact. As he’s lost more and more of his vision, he’s relied more and more on TriMet. He rides the 77 to church, not just for Sunday services, but also to volunteer in the Meals on Wheels program serving a hot lunch to seniors. Other days he takes the 77 bus and transfers to the MAX to visit his close friend Jim Holst in downtown Portland. Waldo and Jim met through Holst’s work as a financial advisor, but they have become family to each other. Waldo spends every Christmas and Easter with the Holst family. Jim and Kathie’s children have known Waldo all their lives, in fact their daughter just celebrated turning 16 at a joint birthday party with Waldo. TriMet’s General Manager McFarlane presented Waldo with a few tokens of our appreciation for being a dedicated rider, including a “How We Roll” t-shirt and a lifetime pass. “I can’t wait to use my lifetime pass and I loved the birthday bus!” said Johnson.